Welcome to Real-life Sci-fi worlds. We are using science to explore life-bearing worlds that are good settings for science fiction. Let’s take the Earth and change just one small characteristic: the shape of its orbit. Many of the known extra-solar planets have orbits that are pretty elliptical (we talked about this in a previous post). The average “eccentricity” is about 25% or 0.25. An eccentricity of zero means a perfect circle and 1 is infinitely stretched out. The higher the eccentricity, the farther the Sun is from the center of the ellipse. Orbits with the same average distance but different eccentricities e. The higher the eccentricity, the more stretched out the orbit. Credit: NASA Earth Observatory. The more eccentric an orbit is, the closer it passes to the star at its closest approach. At the same time, the planet passes by this closest approach very fast. The planet spends most of its time far away from the star. 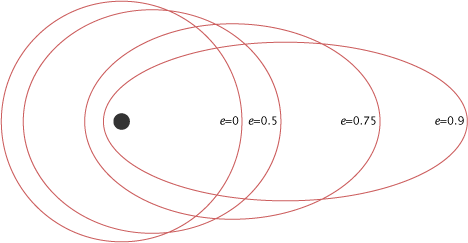 The total amount of energy received by the planet is higher for eccentric orbits, but only by a very small amount unless the orbit is extremely elliptical (with e larger than about 0.5-0.75. On a planet with a stretched-out eccentric orbit, everything is more extreme than on a circular orbit. The hot is hotter and the cold is colder. For a very eccentric orbit, the planet is basically branded during its very short closest approach to the star. The planet then spends the rest of its orbit — especially the long cold winter far from the star — cooling off. Like running from the hot tub into the snow and then back (although if you’re like me, you spend a lot more time in the tub than in the snow, but planets in orbit do the opposite!). An eccentric Earth is not uniformly heated. There are much larger temperature swings than on Earth. Still, the entire globe of an eccentric Earth with the same average orbital distance as Earth is habitable. What matters is the total energy received over an orbit, not the instantaneous heat from the star. There is a particularly interesting place on an eccentric Earth. It is the location where the star appears directly overhead during the planet’s closest passage to the star. This is where the planet is branded. This location receives a short burst of heat that is stronger than anywhere else on the planet. [In reality, it is of course spread over some area.] Let’s call it the branding spot. But the planets were are talking about are spinning and they spend many days near closest approach. So the branding “spot” is really a ring at constant latitude. Imagine the tropics but shifted up or down to any latitude. Is it good or bad to be sitting on the branding spot? Well, it depends. For a planet with the same average orbital distance as Earth, there is a danger from overheating. If the orbit is eccentric enough then the branding spot gets fried. Not the place you want to be! But if the planet is much colder then it could be nice to be near the branding spot. To be close to the once-a-year burst of heat in an otherwise icy world. This image shows a pretty cool example taken from a real climate model. Temperature map of the climate of eccentric Earth over a full year. The temperature at a given latitude on the planet can be read by the change in color along the horizontal line at that latitude. 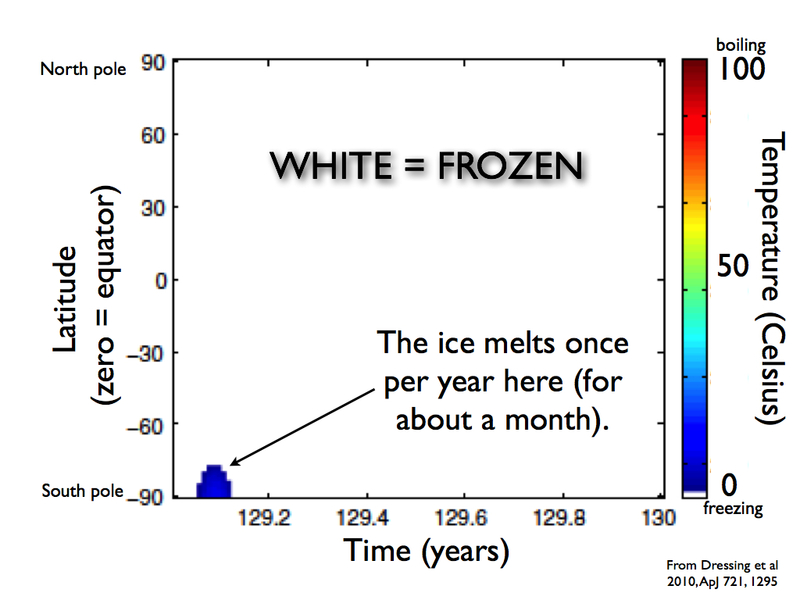 White means frozen and other colors indicate habitable temperatures. The planet is a desert world with an eccentric orbit. The only place that is heated enough to melt the ice is at the South pole once per year. Taken from this scientific paper by Courtney Dressing and collaborators (including me!). The branding spot of this planet is at the South pole (it’s actually a spot, not a ring, since it’s located at the pole). The entire planet is covered in ice. But once per year the South pole is heated sufficiently that it melts and produces conditions friendly to life. This only lasts for about a month before freezing over, but it is the only time on the entire planet that it happens. The typical giant extra-solar planet has an eccentricity of about 0.2-0.3. Unfortunately, it’s very hard to measure the orbital shape for small planets. There is some evidence that smaller planets tend to have less eccentric orbits, but it’s pretty tentative. Simulations also show that small planets probably have more circular orbits than giant planets. But those same simulations also show that some Earth-sized planets should actually have very elliptical orbits. So even though eccentric Earths are likely to be less common than eccentric Jupiters, they should still exist. In fact, it is planet-planet scattering among Jupiters that probably stretches out the orbits of the Earths anyway! Some ballpark figures. About 10% of stars have a giant planet like Jupiter. 80% of those underwent planet-planet scattering. Earth-like planets survive half of the time. 10% of these have orbits with eccentricities larger than 0.2. That makes a few eccentric Earths per thousand stars. There are more than 1000 stars within 50 light years of the Sun. So there are likely to be a few eccentric Earths close by. I wouldn’t be surprised if an eccentric Earth turns up in the coming years (or is already lurking among the known planets). What kind of story could take place on an eccentric Earth? What is different about an eccentric Earth is how the climate changes in such an extreme way during the year. And the most interesting location is the branding “spot” or ring. Here are two ideas for story lines. Story 1 takes place on the icy world shown in the climate simulation above. The planet completely covered in ice except for one month a year at the South Pole. It is freezing and pretty Hoth-like. A cold cold place. There is a network of tribes that survive on the icy world. Given the harsh conditions the population density is low. Each tribe is adapted to its local ecosystem. Some tribes specialize in fishing through holes in ice-covered lakes. Others follow and hunt the animal populations. Still others subsist on small amounts of greenery that manage to survive in localized settings. Every year many of the tribes migrate to the South Pole to enjoy the month-long burst of warmth. This month is accompanied by a massive burst in biological production, with new vegetation and insects feeding animals. Those animals are hunted by the tribes. It is feast time! Star-crossed lovers from different tribes do a Romeo-and-Juliet impression. A giant man-eating beast hibernates all year long at the South Pole except for the month during which his prey flocks to him. A tribe discovers an alternate source of heat. It starts to create its own warm spot on the planet, triggering massive changes in the planet’s climate and a battle for control of the planet…. Story 2 takes place on a hot eccentric Earth. The climate is Earth-like when the planet is far from the star but dangerously hot during close approach. The branding spot is deadly hot. It is a ring located at about 70 degrees North (a little North of the Arctic circle on Earth). Along the branding ring the temperature gets up to 100 degrees Celsius (the boiling point of water; 212 degrees Fahrenheit). This only lasts a couple of weeks during summer (it’s shorter than in the icy world described above because the planet’s orbit is closer to its star). The planet is covered with life. But the Northern-most part of the planet is abandoned during the summer. The population flees to the South to avoid the heat. The story follows a small band of over-ambitious hunters caught too far North. Summer approached too quickly and they were trapped North of the branding line. Their only hope: to go North. Since the maximum heat is right at 70 degrees latitude, they hope to get to the Pole where it is (a little bit) cooler. It’s a story of survival (or not) in extreme and changing conditions. All sorts of cool things to imagine…. There you have it, the first real-life sci-fi world: eccentric Earths. Are there any science fiction stories set on eccentric Earths? Yes. One of the very early LOST IN SPACE episodes featured an eccentric earth. No doubt the exact timing of events wouldn’t fit climactic reality but here is what I recall from the LOST IN SPACE episode. The Robinsons landed on an eccentric earth during its long cold spell and went exploring in the JUPITER II’s land vehicle. Dr. Smith and the Robot stayed behind in the JUPITER II. The LEV crossed a frozen sea to another continent. The temperature warmed as they were on that continent, enough so the Robinsons enjoyed some beautiful weather. That’s when they realized they were on an earth with an eccentric orbit and that briefly, where they were would get fried. They lay down on the ground under reflective space blankets (in real life, newly invented by NASA as I recall); in short order, the bushes were catching on fire all around them. After the very brief hot spell, they took water and returned. They crossed the same sea on their return, but then it was melted and stormy. They returned to the JUPITER II before it cooled too much and Dr. Smith and the Robot received them home. One more thing: I learned about the gas giant thanks to this production by NATIONAL GEOGRAPHIC. I then looked up more information on (where else?) WIKIPEDIA, concerning the 16 Cygni system. In my writing I sought to add one element not mentioned in the video: the effects of tidal flexing. If the Galilean moons, or at least three of them, are significantly affected by this (and especially Io), why not Beebee III? Great stuff, thanks for the heads up. And yes, tidal flexing is a key process on close-in planets. I’m going to write a post about that soon. How about a Game of Thrones climate with winters of varying lengths (multiple “years” in the books) but some winters are a few years and other winters are many years long? Good question Brent! Weird Milankovitch cycles have been suggested as a possible source of the uneven winters in Game of Thrones — see here: http://io9.com/5906300/5-scientific-explanations-for-game-of-thrones-messed-up-seasons. But there are lots of other explanations: http://www.howtogeek.com/187541/climate-and-astronomy-in-game-of-thrones/. There was actually a modestly-serious scientific paper showing that a planet on a certain type of orbit around a binary star system can produce unpredictable winters: http://adsabs.harvard.edu/abs/2013arXiv1304.0445K . Then there is the set up in _Fire Time_ by Poul Anderson. A red giant & a sun like star are in eccentric orbit about one another with a period of roughly 1000 years. The sun like star has a habitable planet that gets enough extra heat when the red giant is closest to disrupt the weather but not to fry the planet. When the red giant is closest it is in near the north celestial pole of the habitable planet, so the northern hemisphere gets the worst of the unpleasantly hot weather. If the action in a Poul Anderson story takes place on a planet in another solar system, the planet in question will be well thought out. Alan Dean Foster’s Icerigger trilogy is set on Tran-Ky-Ky, which has an eccentric orbit that results in alternate freezing and warming cycles.